Seriously? Is this for real? Yep sure is, you can dine in the sky, you can lounge in the sky, you can have a show in the sky... and for those of you out there that are looking for some height and pizazz on your wedding day you can even get married in the sky. 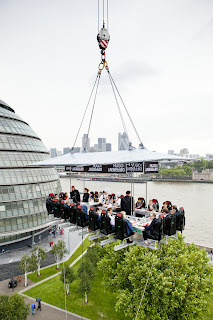 I really really want to get up in the sky and do the dinner in the sky, it looks super exciting. Anyone wanna go up with me? I have never done this but would love love love to do this. Your hoisted up into the sky on a platform with seats around a table, there is umbrella/roof above your head and you go wayyyy up in the sky. It looks to be attached to some sort of crane. You are safely buckled in the seats with seat belts. You can have 22 people seated at a “table” and can have up to 5 staff standing in the middle.